Those of you who helped create the Sunflower Avenue (http://leabanksquare.blogspot.com/2009/04/leabank-square-takes-part-in-hackney.html) last year will be pleased to know that we are doing a Wildflower Avenue this year as well. In preparation for next spring - we are seed bombing a path all the way from Mabley Green Meadow (http://mableymeadow.blogspot.com/) - through Hackney Wick - to Viccie Park. Besides just wanting to make our streets look lovlier - one of the other reasons is to have a beautiful path to follow either way - to the meadow & rock (http://leabanksquare.blogspot.com/2008/08/mabley-green-boulder-by-john-frankland.html) - or to Viccie Park. We have made all the seed bombs (http://leabanksquare.blogspot.com/2010/10/brilliant-open-day-for-purple-garden.html) - so all you have to do is turn up at the Mabley Green Rock on Sunday at 11am - and take a stroll with us along the route - and bomb Hackney Wick. There will be a cuppa waiting for you in the Leabank Square Purple Garden at the end - and you can simply chill looking at the world drift by on the River Lea. 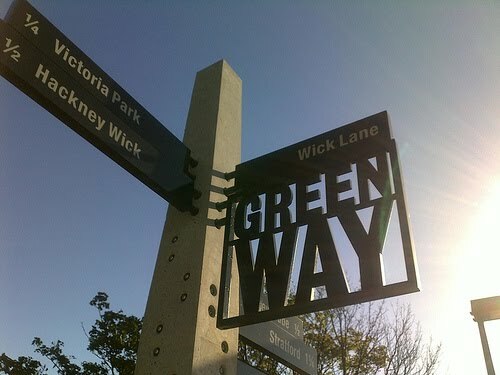 The Hackney Wick end of the Greenway has been completely changed in the last few years. Gone is the muddy, burned-out motor-bike, overgrown, lawless, ASBO populated path of old. Some may say that they loved it that way - but families, cyclists & some of Hackney Wicks longer term residents are happier as it is slowly becoming. The whole area has been severely hard landscaped - and although a few landmarks like the Second European War Pillbox (http://hackneywick.blogspot.com/2009/03/is-this-pill-box.html) and some of the apple trees we planted years ago - are still there - but it's time to start replanting. We tried some guerrilla planting a few weeks ago - but the whole area is infested with Olympic guards now - every time we pulled out a shovel - a pair of jackboots was soon on the scene. The Olympic Delivery Authority (ODA) are doing a voluntary planting day this Friday 29th along the Greenway. This is an ideal way to see what is being planted by them - so that we don't duplicate some of our efforts. Plus - you get a free lunch in the bargain from our good friends at the View Tube Cafe (http://www.theviewtube.co.uk/) into the bargain. It's open for all - though the very short notice is somewhat suspicious - so please come along. Meeting up at the View Tube Cafe at 10am for a quick chat & introduction. Planting then takes place between 10.30am & 1.00pm - with everything supplied by the ODA. Then your free lunch at 1.00pm - with the day closing at 2.00pm. So please come on down and enjoy a bit of time with fellow Wickers - and you'll get to be part of the future landscape of Hackney Wick! The Evening Johnson yesterday illustrated the current 'Nature is in crisis as a third of animals and plants face extinction' story - with a pic of some crocuses. I'm not too sure that they fall into the one third category - but just in case - please get down to Trafalgar Square tomorrow at 11.00am. The International Flower Bulb Centre, The Eden Project and Rotary International have clubbed together to give away thousands of Ruby Giant crocus bulbs in Trafalgar Square. Even if these beauties are not under threat internationally - Hackney Wick has just 14 of them growing in Leabank Square - none anywhere else!! So - I URGE you to take your lunch break in Trafalgar Square tomorrow - and try & get as many as you can. Then go maaaaad all over the Wick!! Check out http://www.viewlondon.co.uk/whatson/big-bulb-plant-at-trafalgar-square-article-10180.html for more details. Go on - adopt a (free) bulb - Hackney Wick needs you!! Seedlings for Mabley Green Meadow! The amazing Chris from the Mabley Green Meadow crew delivered loads of trays, seeds, pots, compost & enthusiasm to the Leabank Square Nursery over the weekend - and work is under way to seed stunning flowers! He worked very hard getting this great grant from B&Q - and now the amazing Mabley Green Meadow is soon to look a whole heap colourful. Chris - thank you for doing all this really hard work - you are truly one of Hackney Wick most community spirited residents!! Is this the most beautiful bus stop in London or what?! Incredibly fragrant blossoms drizzle down on you while you wait. Please check it out - about half-way down Berkshire Road - right opposite Leabank Square. Mabley Green Meadow is So Beautiful!! A great day out was had by all yesterday - at Hackney Wick newest garden. Thank you to Chris King for organising such a successful launch. And of course - thanks to everyone who turned up to help, weed, dig, clear, barrow - & plant the soon-to-be stunning wildflower meadow. There is still quite a lot to do - so if anyone wants to still help out - please call Chris @ 07747 437 236. So whether its gardening, weeding, planting, donating - or even just caring - please get involved with your new local garden. It's there for all of us to enjoy!